Disability or limited ability to carry out basic functional activities, becomes increasingly common with advancing age. It has been a challenge for clinicians to measure disability and its resulting dependence. Therefore, it is mandatory to manage well both human resources and equipment needed to treat disabled people within any health-care system. Our country, Andorra, is home to 79,100 people. Its health system has been considered the best in the world concerning the health-care access and quality index. According to 2016, the Institute for Health Metrics and Evaluation data, life expectancy has risen to 85.8 years in women and 79.3 years in men in recent years. Low back pain and neck pain followed by sense organ diseases and skin diseases are responsible for the majority of disabilities in Andorra. Although neck and back pain are significantly higher in Andorra than in other countries, sense organ diseases and skin diseases are statistically indistinguishable. In Andorra, there is a genuine dependence classification called Grau de Dependència Andorrà (GDA), which is used to evaluate the dependence by a community assessment commission (Comissió de Valoració Sociosanità ria), comprised two social workers from social issues department, a nurse, a psychiatrist, and a general practitioner. GDA distinguishes six types of dependence levels, from 0 (no dependence) to 5 (total dependence). Between 0 and 5, 1 includes people with low dependence (they need some occasional help to perform basic activities of daily livings, [ADLs]); 2 includes those with mid dependence (they need help in ADLs at least once a day); 3 includes those with high dependence (they need assistance with the majority of ADLs or they need constant supervision due to cognitive condition), and four includes those with a very high dependence (they need assistance for almost all ADLs twice or three times a day, but a 24 h caregiver is not necessary). Formerly in Andorra, dependent people used to be admitted to geriatric centers due to social or health problems. Approximately 10 years ago, there was a reorganization of the National Health System and a skilled nursing facility called El Cedre was opened. The main reason for setting up El Cedre was to treat people of any age with subacute diseases, dependency, and social problems who needed transitional care before returning to their homes. In accordance with patient's needs, El Cedre had at its disposal a large amount of human resources and equipment including nursing, medical care, physiotherapy, occupational therapy, speech therapy, and neuropsychology. From the beginning, it housed people with chronic diseases and/or subacute illnesses with rehabilitation requirements as well as people with psychosocial problems due to neurodegenerative diseases or dementia. GDA is used as a mean of acceptance to the national public skilled nursing facility (El Cedre), but, more importantly, it is also used to allocate therapeutic and economic resources at the national public skilled nursing facility. As life expectancy in Andorra has increased, the first patients who resided in El Cedre and never returned home due to dependency, financial, or social constraints have aged and their health-care needs have changed. In times of economic crisis, it is essential to manage health facilities efficiently. This paper aims to reevaluate the actual level of dependence of people staying in El Cedre with several validated scales and to measure their dependency against GDA levels and to provide the rehabilitation resources needed for an improved healthcare. We conducted a cross-sectional descriptive study between July 17 and August 4, 2017. All El Cedre residents were evaluated by physical medicine and rehabilitation (PMR) physician. For accuracy, at least one nurse or nursing assistant attended the evaluation as well as a patient's relative. Each patient was measured against the following scales: functional dependence scale (Barthel Index), cognitive impairment scale (Pfeiffer test), assessment of independent living skills (Lawton instrumental ADL scale), and assessment of gait dependence (Rankin modified scale score and functional ambulation classification). All the therapies each resident received (occupational therapy, physiotherapy, speech and language therapy, and/or neuropsychology) were recorded. In addition, patients underwent a physical examination. Consciousness and communicative abilities were first evaluated. Patients were asked to do some simple exercises to assess joint mobility and to stand up and walk if possible. The examination was adapted to every individual. After the evaluations, PMR physician established rehabilitation requirements for each participant. Each patient's goals were set in regard to physiotherapy, speech and language therapy, occupational therapy, and neuropsychology. We evaluated 143 patients (120 inpatient and 23 in day hospitals) of which 48 were men and 95 were women. The mean age was 81.34-year-old within an age range from 55 to 97 years [Table 1]. To qualitatively measure patients' dependence, we calculated the current GDA [Table 2]. GDA comes out of the result of a combination of Pfeiffer test, Lawton instrumental ADL scale, and Barthel index [Table 3]. 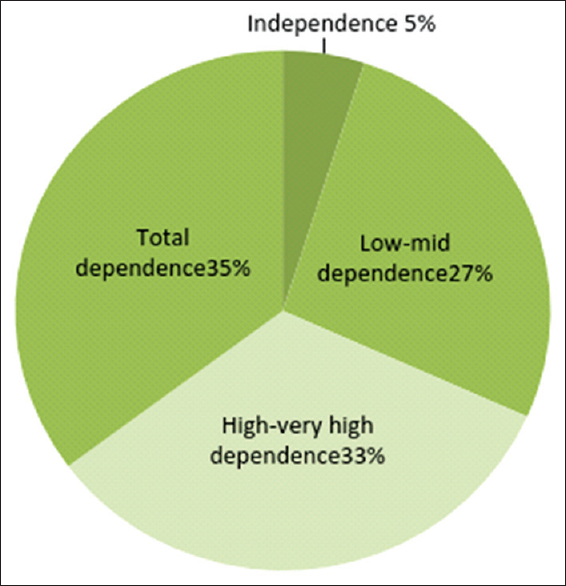 It is worth to highlight that almost 70% of patients had at least high dependence. GDA levels of dependence were gathered in four groups, from A to D [Table 4] and [Figure 1] to allocate rehabilitation resources. Specific impairments of the sample are described taking into account each scale. The Pfeiffer test results, which recognize cognitive impairment existence and classify it in low (3–4 mistakes), mid (5–7 mistakes), and high (8–10 mistakes), identified more than a half (53.8%) suffering from this cognitive deterioration. Only 23% of participants had no cognitive impairment. Concerning Rankin modified scale score, which categorizes disability in 7° (from 0, no symptoms, to 6, death), 27.9% of the sample did not suffer from disability or only had few limitations on their day-to-day activities, but they could perform ADLs without inconvenience. The vast majority (72.02%) had moderate-to-high disability, so they needed assistance in some instrumental activities, and although they did not need it in ADLs, they required a caregiver at least once a day. Functional ambulation classification categorizes the patients from 0 (no gait capacity) to 5 (independent gait in any surfaces) according to their basic motor abilities to gait performing. Nearly 35.6% of participants had independent gait capability both in flat surfaces and stairs or slopes. In contrast, a 30% of the sample did not walk or they needed assistance or supervision to do so safely. Among all the participants, up to 61.55% needed assistance to walk. Comparing PMR evaluation to GDA results, we found no correlation between GDA level and rehabilitation requirements. A high level of dependency in GDA can be due to cognitive impairment, motor impairment, or both. Thus, each predominant type of impairment needs a specific rehabilitation program. As a result, we formed four groups, gathering in one group, the patients predominantly affected from cognitive impairment; in another group, the ones with a physical deficiency; in the third one, the participants with both cognitive and physical impairment, and in the last group, those with no disability. We found 28 participants affected by physical impairment against 75 participants suffering from cognitive impairment. Totally 12 participants had no relevant impairments and 28 of all had both of them equally [Table 5]. We made a report showing our study results to hospital executive department aiming to assist with El Cedre management with their rehabilitation requirements. It is widely known that disability holds a great consumption of resources. The convention on rights of persons with disabilities was the first United Nations Treaty to protect the fundamental rights of people with disabilities and encourages all member states to adopt appropriate measures to eliminate discrimination and poverty, improve health, quality education, and employment of people with disabilities. The World report on disability identifies PMR as a fundamental process to support physical independence, mental, social, and vocational ability and encourages Member States to identify and address the barriers faced by people with disabilities. Thus, the primary purpose of rehabilitation is to enable people to function at the highest possible level despite physical or cognitive impairment. PMR physicians are the medical specialists who can better evaluate dependency and disability. In Andorra, the first national public skilled nursing facilities (El Cedre) were opened around 10 years ago. El Cedre population has not changed substantially in this period apart from aging. In this context, as PMR physicians, we met a need of reevaluating the level of dependency of El Cedre's patients to adjust allocated rehabilitation resources that were decided following GDA classification so far. We found that GDA can be a good instrument to evaluate dependency but not appropriate to assign rehabilitation goals and resources. The lack of correlation between GDA and rehabilitation lies in its inability to differentiate cognitive and physical impairment. As previously mentioned, patients' level of dependency results from the existence of cognitive impairment or motor impairment or their coexistence. Each type of impairment needs specific rehabilitation program and their goals have to be set by a PMR physician. This study has strengthened communication between the staff and the patients and their relatives, increasing satisfaction. The integrated care seems to improve patient experience and facilitate goal setting. The study was conducted in a European country with well-developed health and care services for older people. It should be feasible to generalize the intervention. On the other hand, all patients were evaluated by the same PMR physician, which can lead to subjectivity bias. To entirely evaluate disability, it is necessary to use both instruments of cognitive and physical assessment. PMR evaluation in a skilled nursing facility resulted in a change in allocating therapeutic resources, establishing properly the rehabilitation goals. Moreover, integrated care methodology can be widespread to improve health-care management. Further studies are needed to create and validate an objective instrument to assess disability taking into account both cognitive and physical impairment and to properly allocate rehabilitation resources. The authors would like to thank all the participants, their families, and all El Cedre's staff for their contribution to this study. Special thanks to the rehabilitation team (Gemma Castellarnau PT, Natalia López OT, Marc Moya PT, Sandra Navarro NP, Laia Palmitjavila SLP), Ms. Ana Flujas (El Cedre's Director) and Eva Heras MD. Heonig H, Colon Emeric C. Overview of Geriatric Rehabilitation: Patient Assessment and Common Indications for Rehabilitation. Uptodate; 2017. GBD 2015 Healthcare Access and Quality Collaborators. Electronic address: cjlm@uw.edu, GBD 2015 Healthcare Access and Quality Collaborators. Healthcare access and quality index based on mortality from causes amenable to personal health care in 195 countries and territories, 1990-2015: A novel analysis from the Global Burden of Disease Study 2015. Lancet 2017;390:231-66. Andorra metrics from Institute for Health Metrics and Evaluation; 2017. Available from: http://www.healthdata.org/andorra. Busetto L, Luijkx K, Vrijhoef HJ. Advancing integrated care and its evaluation by means of a universal typology. Int J Care Coord 2017;20:41-4. Doroszkiewicz H, Sierakowska M, Muszalik M. Utility of the care dependency scale in predicting care needs and health risks of elderly patients admitted to a geriatric unit: A cross-sectional study of 200 consecutive patients. Clin Interv Aging 2018;13:887-94. Fairhall N, Langron C, Sherrington C, Lord SR, Kurrle SE, Lockwood K, et al. Treating frailty – A practical guide. BMC Med 2011;9:83. United Nations. Convention on the Rights of Persons with Disabilities; 2006. Available from: http://www2.ohchr.org/english/law/disabilities-convention.htm. [Last accessed on 2017 Feb 10]. WHO Library Cataloguing-in-Publication Data World report on disability 2011. Khan F, Owolabi MO, Amatya B, Hamzat TK, Ogunniyi A, Oshinowo H, et al. Challenges and barriers for implementation of the World Health Organization global disability action plan in low- and middle- income countries. J Rehabil Med 2018;50:367-76. Lopes H, Mateus C, Rosati N. Impact of long term care and mortality risk in community care and nursing homes populations. Arch Gerontol Geriatr 2018;76:160-8. Jeon YH, Casey AN, Vo K, Rogers K, Poole B et Fethney J. Associations between clinical indicators of quality and aged-care residents' needs and consumer and staff satisfaction: The first Australian study. Australian Health Review AHHA 2018. Available from: https://doi.org/10.1071/AH17213.